It has been a very long time since I was kept awake late into the night because I simply could not put down a book I was reading. Last night I began The Word of the Lord to Evangelicals at about 11pm and I could not stop until I finished it. This book is actually quite short and easy to read. It tells the story of a college student named Wendy who meets a homeless man claiming to be God. As the story continues Wendy’s faith and life are changed as she encounters “God” at different times throughout her educational career. I am usually not a fan of books that use fictional stories to teach a lesson. I could not make it through A New Kind Of Christian which was McLaren’s first of this type of book. The brevity of The Word of the Lord to Evangelicals seems to work to McLaren’s advantage though. He concisely and aggressively makes his point about the problems of the evangelical world in a releatable way. This section of distorted Scripture is amusing, enlightening, and terribly challenging. 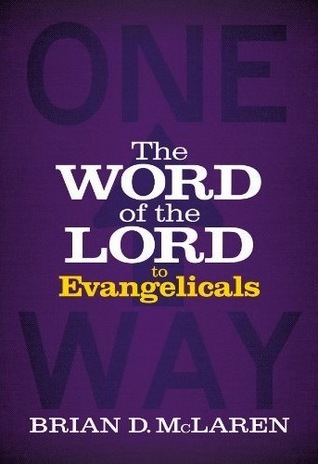 The Word of the Lord to Evangelicals is only available digitally–downloaded from Amazon or Barnes & Noble. Make it the next book you read. For more like this check out The Word of Lord to the Republicans and The Word of Lord to the Democrats. Who Cares What You Believe?